To cost-effectively produce clean electricity, utility-scale solar (USP) power plants often cover a sizeable land area. This may require grading of the land and other alterations, including fencing and road construction, which can affect the habitats of local and migratory species. The laws and regulations governing power plants’ environmental compliance in the United States are among the most stringent and detailed in the world with regard to mitigating the possible impacts of such facilities on wildlife. As a result, the solar industry has developed extensive experience with and sensitivity to handling habitat issues. Every single large-scale solar project proposed on either private or public lands in the U.S. must navigate complex federal, state, and local regulatory channels regarding natural resources and habitat conservation. Through the Bureau of Land Management (BLM), the U.S. Department of Interior is authorized to permit the development of solar and other energy projects on federal public lands. BLM right-of-way (ROW) permits undergo a strict review process before being issued, as required by the National Environmental Policy Act of 1969. Solar companies provide detailed project construction plans, conduct numerous environmental studies, prepare Environmental Impact Statements (EIS), and propose mitigation strategies. The BLM, in coordination with the U.S. Fish and Wildlife Service, state and local authorities, conducts analyses of the site and holds public hearings with members of the community to gauge the impact of the project on the area. An EIS is issued for each project before the final Record of Decision is announced. Environmental review of a proposed solar power plant on public lands can take three to five years. When managing solar projects sited near sensitive habitats, solar project developers have consulted closely with federal and state agencies to ensure maximum protection and conservation. BrightSource Energy, Inc. consulted with agencies regarding its proposed 370 megawatt Ivanpah Solar Electric Generating System on public land in San Bernardino, Calif. 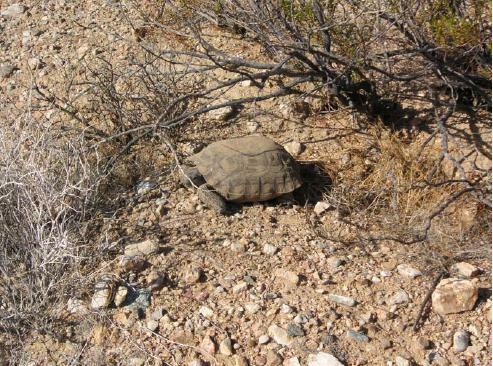 Among its habitat and land mitigation plans, the company developed a Desert Tortoise Translocation Plan and a Revegetation and Reclamation Plan, including the purchase of 4,000 acres of land to relocate the tortoise and other sensitive plant and animal species. SolarReserve, LLC developed the Crescent Dunes Solar Energy Project, located northwest of Tonopah, Nevada. Developers installed and maintain transmission lines in accordance with guidelines that ensure the least possible interference with local bird populations, while also monitoring the nest of a nearby endangered golden eagle during and after construction. To deter small wildlife creatures, 8-foot high fences were installed around the evaporation ponds. SunPower Corporation redesigned the PV array layouts on its 250 megawatt California Valley Solar Ranch in San Luis Obispo, California to substantially avoid sensitive biological resources, including eliminating one array to reduce impacts on the Giant Kangaroo Rat (GKR) population. To promote wildlife migration, SunPower also removed some exclusionary fencing.